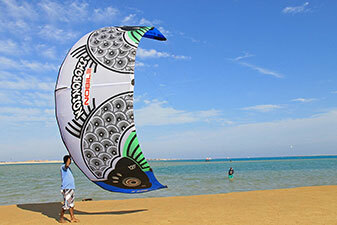 We also offer the perfect spot and lots of space for all kite surfers. On the left hand side of our station and about 20 meters from the beach there is a 2 kilometer long and 600 meters wide area where you can stand. Depending on the tide it is between 30 cm and 60 cm deep. The hip deep water is the perfect place to learn how to body drag, stand up on the board, ride upwind or how to do the first jumps. By low tide a part of the sandbank is dry for about 2.5 hours. 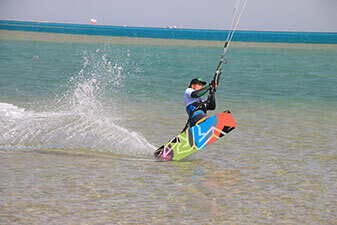 But even during this time you have an area to kite just behind that sand bank. We have a big storage space where you can leave all your material and to not waste any time pumping up there is a compressor. There is enough space to set up and pack down or to just put your kite down while you are taking a break without interfering with other surfers. What we have for you? 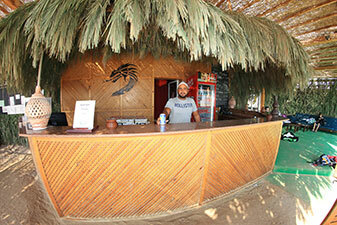 Our team is here to the beach and in the water to take care of you. We are equipped with several boats at any time to help. Also for launching and landing the kite someone is always there for you. Our staff always has an eye on you ….